At the end of a beautiful peninsular, with its Genovese tower keeping watch, Villa U Tramontu is a wonderful family home with spectacular sea and mountain views on the glorious west coast of Corsica. Just under an hour south of Ajaccio, once you have arrived it will be hard to leave. This is the owner's home away from home; their oasis to escape to with family and friends to mingle, relax and spend quality time together. There are five spacious bedrooms, each with their own en-suite bathrooms and some with glorious sea-views as you step out to the lower terrace, plus a small single room if needed. The living space on the upper floor enjoys spectacular vistas of the sea and gardens, and leads straight out onto a spacious terrace; a wonderful spot for morning coffee or an evening with family or friends under the starry sky. Yet it's the gardens, terraces and heated swimming pool that will overwhelm you with their beauty and their conviviality. The bright gardens are full of Mediterranean delights with terracotta pots filled with geraniums, overhanging bougainvillea and hydrangeas bursting with colour. The infinity swimming pool is an oasis of calm as you gaze out over to the sea and long leisurely lunches can be enjoyed in the shade of the poolside pergola. On a clear day you can see most of Corsica's majestic peaks, including Monte Cinto, the highest mountain in Corsica. As the evening approaches, take a chilled glass of wine to the decked outdoor lounge and watch the dazzling sun set over the sea, after all 'U Tramontu' is Corsican for sunset. You can wander down to the sea, just 300m away, where you will be able to swim from the rocks into the clear blue water. There are some lovely sandy beaches within a short drive, such as Portiglio beach (3.5km) with its brilliant watersports instructor or the picturesque Mare e Sole beach, perfectly sheltered from the wind and a wonderful place for paddling and swimming. All along this coastline you can seek out magical white sandy beaches, some with some amazing fish restaurants, many accessible only by foot or boat. Indeed, this region is a hiker's delight with amazing walks for all abilities through the sweet scented maquis with idyllic views of the sea and mountains. It's no wonder Corsica is known as ‘‘L'Ile de Beaute' with its white sandy beaches, cascading streams and breath-taking valleys with mountain villages. Head north to Ajaccio, the birthplace of Napoleon Bonaparte, to experience the charm of the region's capital or follow the winding roads south to timeless villages such as Olmeto and Sartene. Dine in some fabulous restaurants across the region, whether it's the nearby relaxed pizzeria or delicious Corsican cuisine, such as wild boar and chestnuts, in more refined surroundings. Yet with the dazzling vistas of mountains and sea from the terraces, infinity pool and gardens, it will be hard to tear yourself away from this unique and charming home. Corsica is known as the ‘‘Ile de Beaute' with good reason, with hundreds of white sandy beaches and coves, cascading streams and waterfalls, fresh water pools and beautiful villages in the spectacular mountains. Villa U Tramontu is located in the bay of Ajaccio, one of the most attractive parts of the Corsican coastline. 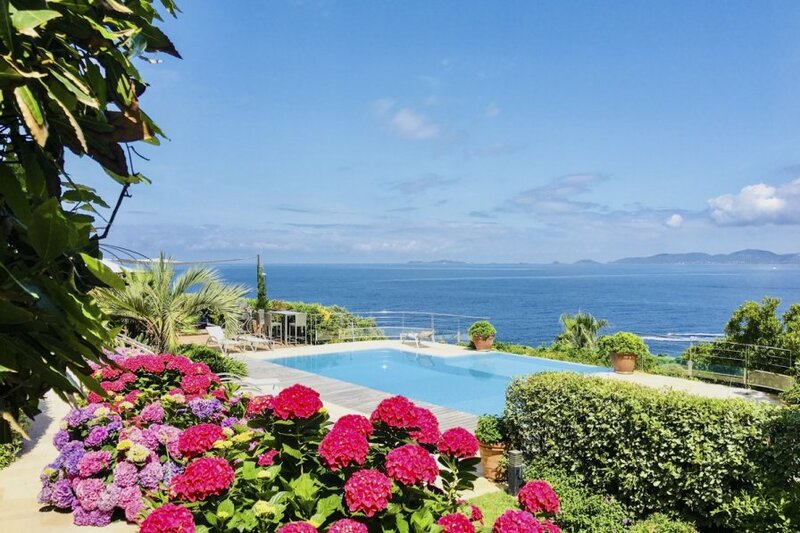 Just 45 minutes south of Ajaccio Airport (32km), on the Cap de La Castagne, this villa enjoys extraordinary sea-views and magical sunsets. The villa is in a privately accessed residential area with other attractive villas dotted around, each one with their own privacy facing the sea and mountains. The area is quiet, yet there is plenty to do nearby if you wish to get out and explore. On a clear day you can see some of Corsica's highest peaks, including Monte Cinto, the highest mountain in Corsica. You can walk about 300m down to some rocks which you can swim from or the lovely Portigliolo beach (3.5km) is just five minutes by car, with a great year round watersports instructor plus equipment and boat hire. The idyllic Mare e Sole beach (9km), perfectly sheltered from the wind, is ideal for paddling and swimming in the clear blue waters. All along this scenic coastline you will find wonderful white sandy beaches, some only accessible by boat or foot. This region is very popular with hikers, there are some wonderful walks to suit all abilities. Dine at Chez Mico (3km) with its lovely garden and tennis courts, a particularly nice place for families with its relaxed atmosphere or head up the coast to the famous La Bergerie (12km) for refined cooking in a sublime setting. There are also stunning fish restaurants right on the beach in this area, again often only accessible by foot, boat or 4x4 where you are rewarded by amazing fresh food in idyllic settings. There is a mini-market within a few minutes by car or you can head up to the seaside resort of Porticcio (18km) for a greater choice of shops and larger supermarkets. Head north to visit the island's capital, Ajaccio (36km) in just over an hour and visit the city's art galleries, markets, fantastic restaurants and hang out in the wide-open squares facing the sea. This is of course the birthplace of Napoleon Bonaparte and you can visit his childhood home. If you are feeling really adventurous you can take the charming train from Ajaccio to Corte for the day, passing incredible scenery as it winds through the forests and mountains, a spectacular and relaxing way to see the interior of this amazing island. Alternatively, following the winding roads south to discover some beautiful villages such as Olmeto (42km) with its timeless charm and mountain scenery or Sartene (55km), a picturesque and unspoilt town steeped in tradition with a fascinating history, wonderful wines and more spectacular valley views.